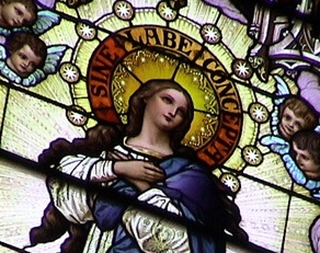 Here’s Day 4 of the Immaculate Conception Novena! Please remember and pray for Cillian and his mum and dad. Thank you and God bless. Please pray for me and my vocation. I am hoping to join the Missionaries of Charity as soon as I finish paying off my student loans, which is a sizable amount. I pray for perseverance in my vocation. Most Blessed Mother Mary & all the angles and Saints please intercede for us to be able to become less so that Jesus is more ! AMEN ???? ???? ???? My intention for today is that my dad doesn’t get sick from any chemo during this transplant. Also, that we can get through this hurdle as a family. And to have a great 2018 with no serious problems. With faith, thank you, please prayers for my whole family. Especially for my 20 year old daughter Vanessa. That the court will not give her any jail/prison time. For her conversion, repentance and healings. Queen of Angels Mother of our Lord Jesus, Please pray for my daughter Dawn that she may receive a full body healing miracle to remove all her illnesses, her 24/7 high level of pain and meds. It’s been over 15 years now, she so deserves a healing favor with increased good / great days without any pain and suffering. -my family sees what LC is doing to me. -my children marry good people and are happy, protected and not punished for our sins. -LK, MH, RS, NS, LC, SG & TB are brought to sorrowful repentance every second of every day and night for what they have done to me, my family & marriage. In Jesus’ name I pray. Amen! Petition ….ask Jesus why I’m still here. Please protect my daughter and her boy friend. Protect my husband and I as well give them work and love in their hearts. But most of all. Protect my daughter and help her find peace in her heart from the people that hurt her in the past. I pray for a cure for Alzheimer’s. I pray my mother gets healthier and stronger and blessed with a long life. I pray that I find happiness again in all areas of my life. Please make me well and able to cope with Monday. In the name of the Father. Amen. Blessed mother I pray for my financial needs.I pray for money to finance my son throughout medical school. I pray for my famity. Mary of Immaculate I beg u please help me send me of your angel to guide me..Send me miracle to fullfilled my parents dream to have a 88% in NLe board exam…Help me that all I studied must retain in my memory and I answer my exam correctly …I love u..Amen .. I continue to pray for love in our family and peace. I pray that my husband will be protected through out his trips. I pray that my daughters will do well in their exams in Jesus’s name Amen. Please pray for a church member, Farid…whose cancer returned. Pray for a miracle to remove all traces of the cancer in his body. Second, please pray for my uncle, Peter Lee, back in Singapore, whose has a kidney failure and is now hospitalized. He had a surgery some weeks back to remove a diseased colon.